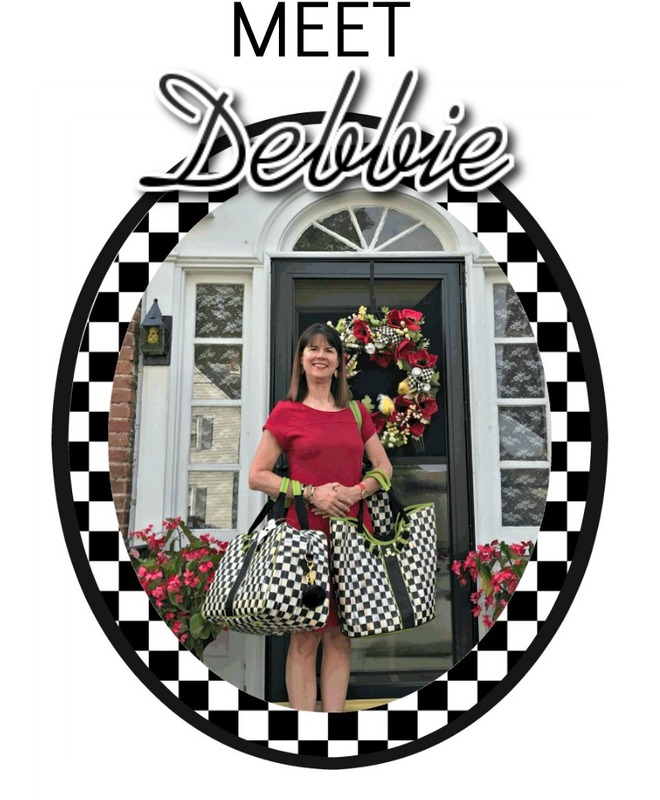 Traveling Tote - Idyllic New York Summer....Another Giveaway! Miss Victoria (Miss Aurora's new sister) and I decided to take you to some special places that we enjoy. 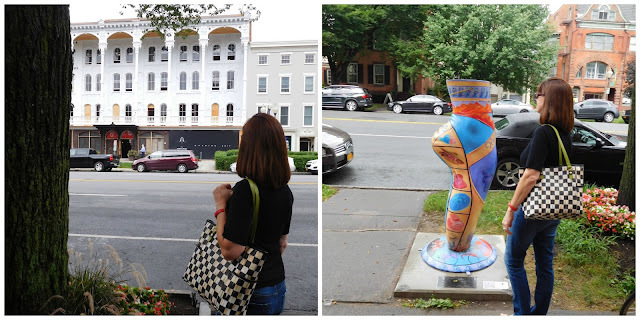 Come along for a little Day Tripping in Tupper Lake (Wild Walk), Saratoga Springs (where I am standing watching the renovation of my favorite Adelphi Hotel), Lake Placid, and Burlington, VT (our beautiful neighbor). New York's Adirondack Mountains are known for it's summers where folks can leave the oppressive heat behind and enjoy the clean lakes and majestic mountains. At the resort we stay at in Lake Placid, radiant flowers grace the Mirror Lake Inn. Jill and her green-thumbed crew do a great job, and I always look forward to their Christmas lights as well. We also enjoyed having our grandson Xavier for an overnight stay! We spent my birthday week at our camp in August enjoying laid back days and picnics on our little mountain. Guests and family enjoy our little camp and swimming in the clear lake. 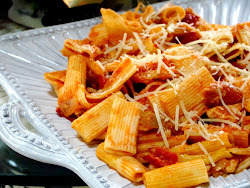 Most of our meals are eaten at the camp, usually prepared on the grill. Our summer ends on Labor Day weekend at the lake, and I’m going to enjoy every last minute. The photos below were taken on our trip to Burlington, VT. Miss Victoria and I enjoyed Lake Champlain, the border between Vermont and New York. I did get caught in the rain though so we were a little soggy. I am so enjoying the friendship with my fellow tote friends. 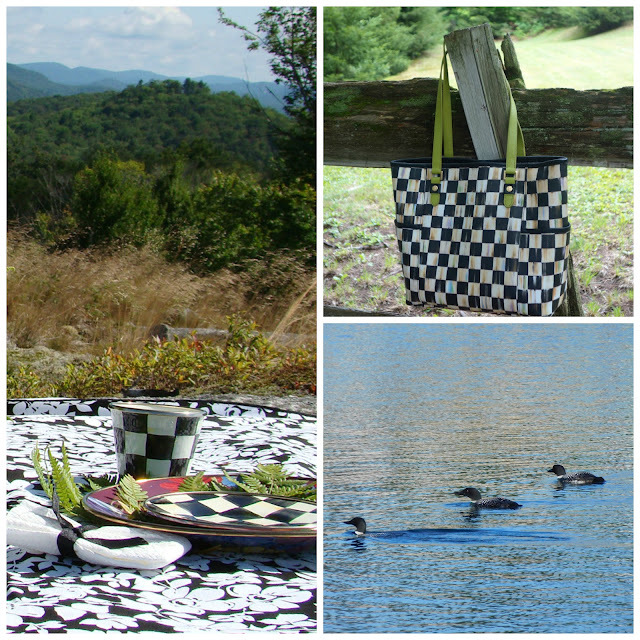 Who would have thought that a tote bag could be our common thread! 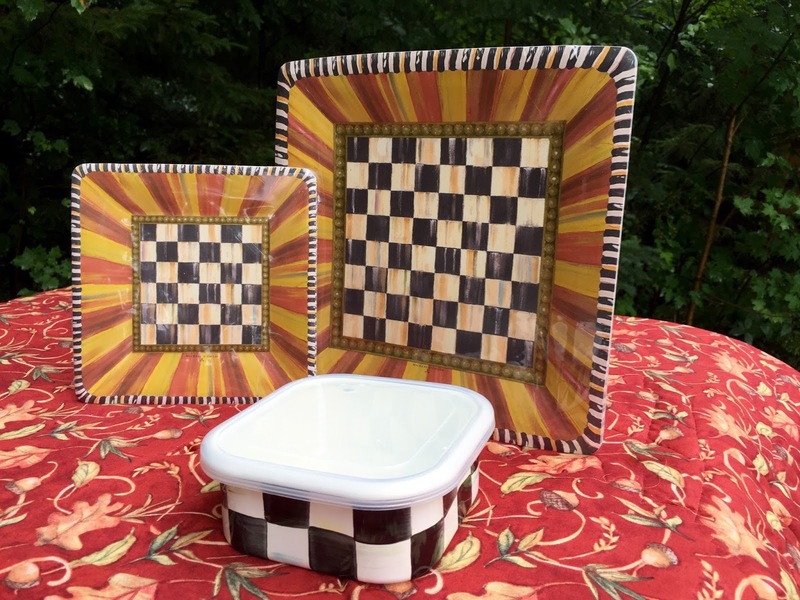 We will offer a Mackenzie-Childs giveaway with our next 5 posts, each time with a different host! 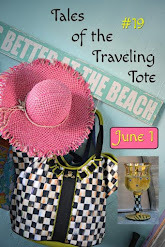 is hosting a giveaway for the Traveling Tote Tribe! Visit her blog for a chance to win 2 pkgs of Mackenzie-Childs paper plates and an enamel storage container. 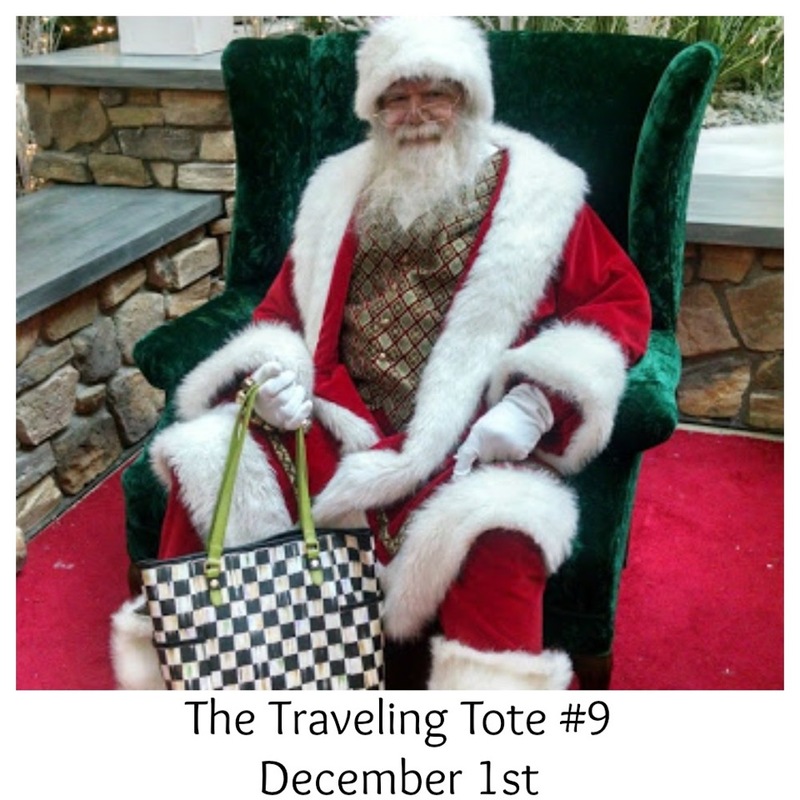 Our next Traveling Tote post will be December 1. Hard to believe that Christmas is just around the corner. Thanks for stopping by! Debbie, I love your kind of summer. I would be very comfortable and compatible with your style. Miss Victoria and Miss Aurora are two lucky chicks! Hahaha, the lead photo of you with antlers....and sweet, baby Xavier - how precious. I really hate to see summer end, so I'm planning on enjoying fall as best I can. I hope you do too. I bet it's sad when you close up camp for the season. Your summer certainly has been special, spending time in so many special places! And your grandson couldn't be any cuter!! Deb, I love day tripping too! Your trips look wonderful, beautiful scenery and fun. What a lovely spot for you to set up and enjoy your meal. Know you enjoyed the stay over with little Xavier. Enjoy your last weekend at camp! 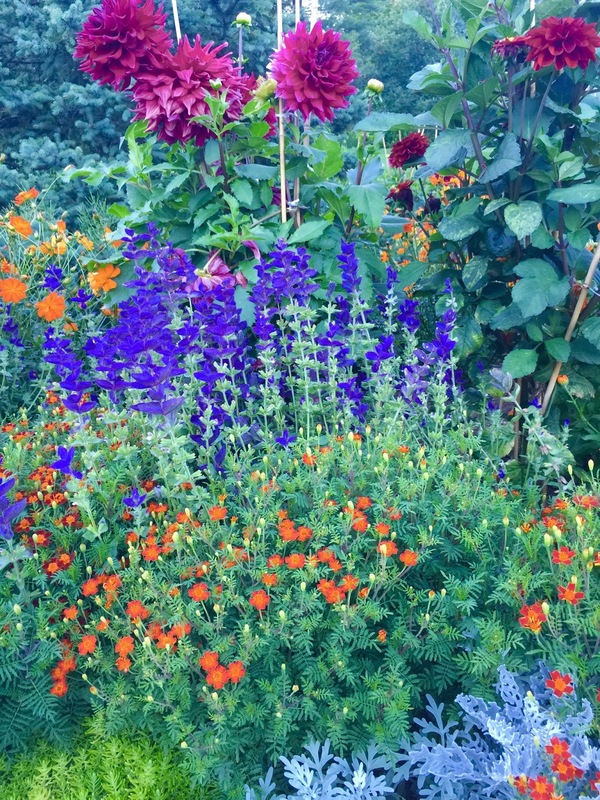 Beautiful vibrant flowers! Oh my goodness, Xavier is adorable and growing so fast. Being a native Vermonter, I have spent lots of time on Champlain in my younger years. Have a great weekend, Debbie. You guys are having so much fun with your totes. I like your way of spending the summer, getting out of the heat! Your little Xavier is a cutie. The Mirror Lake Inn surely puts on a splendid show of flowers. Happy Late Birthday. Sounds like a perfect way to end your summer, lazy days at a beautiful lake! 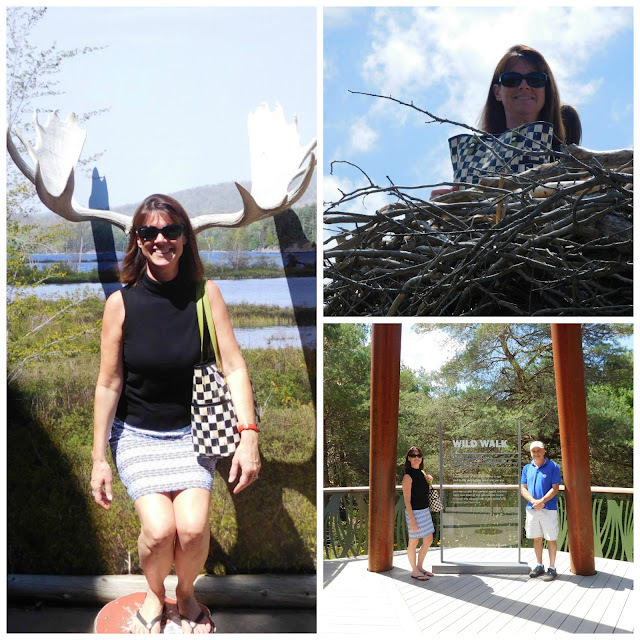 Your traveling totes certainly have a lot of adventures! Your photos brought by nice memories of a motorcycle trip made with friends to Lake Placid and Burlington. Our tour packs were filled with antique treasures on the way home. :) A belated happy birthday, wishing you many more healthy and happy ones.